Brad Markovic will be looking to turn a ‘home turf’ advantage into a winning result when round two of the CAMS Australian Rally Championship roars to life in Western Australia at the Make Smoking History Forest Rally this weekend. WA-based Markovic claimed his maiden ARC podium finish at the 2017 Forest Rally and returns with plenty of confidence this year. “Last year’s result was a real turning point for me,” Markovic said. “I proved to myself that I was able to compete with the top crews in this series, and then we followed it up with ‘first Aussies home’ against the international teams of the Asia-Pacific Rally Championship at the National Capital Rally in Canberra. Markovic started the 2018 season in fine fashion, winning the ARC2 category at The Courier Eureka Rally in March. But this round he’ll face added competition with experienced ARC driver Glen Raymond stepping into the old Subaru WRX of Brad’s Maximum Motorsport team-mate John O’Dowd. “I should have bought John’s car myself to reduce the competition,” joked Markovic. “Last round we had a great battle with Glen and Andrew Penny in ARC2. “This round I’ll again be going head-to-head with Glen, who not only has plenty of ARC experience, but is in a proven ARC2-winning car. “It’s going to be a real challenge but we have a home ground advantage. So if we stick to our own strategy and not get too caught up with what everyone else if doing, we should get a good result”. 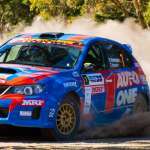 The Make Smoking History Forest Rally kicks off on Friday April 27 with two passes of the Busselton waterfront Super Special stage, before moving to the forestry roads around Nannup on Saturday and Sunday.